The tilt-shift lens allows you to shift and/or tilt a lens on an SLR somewhat like you can on a large-format camera. You can SHIFT the lens to correct perspective distortion, and you can TILT the lens to allow for deeper or more shallow focus. For years the tilt-shift lens was an obscure item that only serious architectural photographers would use — to straighten up the perspective of building images. But the tilt-shift has become strangely popular to use for an oddity: certain scenes will look like miniature toy sets if shot just right with a tilt-shift lens. It is an uncanny effect, and you have to really look closely to believe it is NOT a toy set. Problem is, once you are over the surprise, what is the point? Then the question comes up: can you do most of what the tilt-shift lens does in computer later on? Can't you adjust perspective? Can't you produce the oddly short depth of field look in a scene shot at f22 with a wide-angle lens? Of course you can. Which I suspect means that real tilt-shift lenses will go back to being used by only a few serious architectural photographers. Bottom Line: The tilt-shift lens allows the SLR to have some of the abilities of the large-format camera to adjust lens position so as to adjust perspective and focus. Some of these abilities can be produced later in computer from normal lenses. Tilt-shift lenses can be coaxed into making certain scenes look strangely like miniature toy setups. This shows one of the "real" reasons people would shell out a few thousand dollars for a tilt-shift lens for a 35mm-size camera — so that buildings that are tilting back can be straightened up, primarily for serious architectural photography. Rather than aim the camera up at Nicole and the building I shifted the lens. Compare this to panel 2 where I aimed the camera up instead: the building tilts back. Here I was using the tilt-shift lens, but set it to normal lens position. Here I took the image from panel 2 and straightened up the building in computer, and it looks pretty good. So why spend the bucks for the tilt-shift lens? Maybe because you do serious architectural photography and you want to keep post-processing to a minimum. Or you shoot film and don't believe in computers. Here the tilt property was used to throw the foreground out of focus, much more out of focus than you could get from a 24mm lens by shooting wide open. This is getting into similar territory as the lens baby. Here is the other reason people are shooting with tilt-shift lenses: under certain conditions, you can make normal scenes look just like miniatures — easily more striking than this example. The only problem with this approach is that is essentially a one-trick pony: how many times would anybody want to make a scene look like a toy scene? Here is the "control" image: the same as panel 5, but with no lens tilt. Note that the actual dollhouse scene below, shot with lots of depth of field, doesn't shout out "dollhouse" because it is all in focus. Image courtesy of The Great American Dollhouse Museum. Here the normal image from panel 6 was blurred in computer to give it that abnormally short depth of field. Indicates to me that you can do this fairly well without a tilt-shift lens. 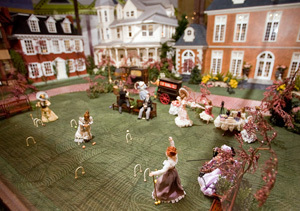 Below is an example of an actual dollhouse scene from The Great American Dollhouse Museum in Danville, Kentucky. Note that the lack of depth of field when using a wide angle lens DOES give it that dollhouse look. 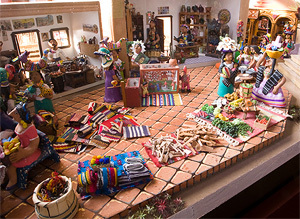 You can't make any old scene look miniature with the tilt-shift lens effect — it has to be a scene that the viewer can believe is a toy "set", in a box. Nicole does not look like a doll (in that sense). 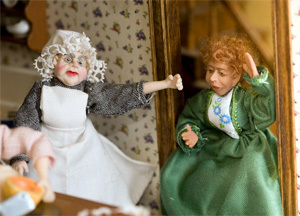 Below, for comparison, are two actual dolls I photographed at the Great American Dollhouse in Kentucky. The shallow depth of field helps us see them as dolls, but mostly we see them as dolls because they ARE dolls.